I love being really active and I'm always on my feet. I seriously need to remind myself to slow down.I walk fast, Clean fast, Speak fast, do everything fast, so obviously I need to take some time to chill out and slow down! I've been hearing a lot about Cryotherapy recently. Seeing celebrities and athletes overseas using this for the numerous health benefits. 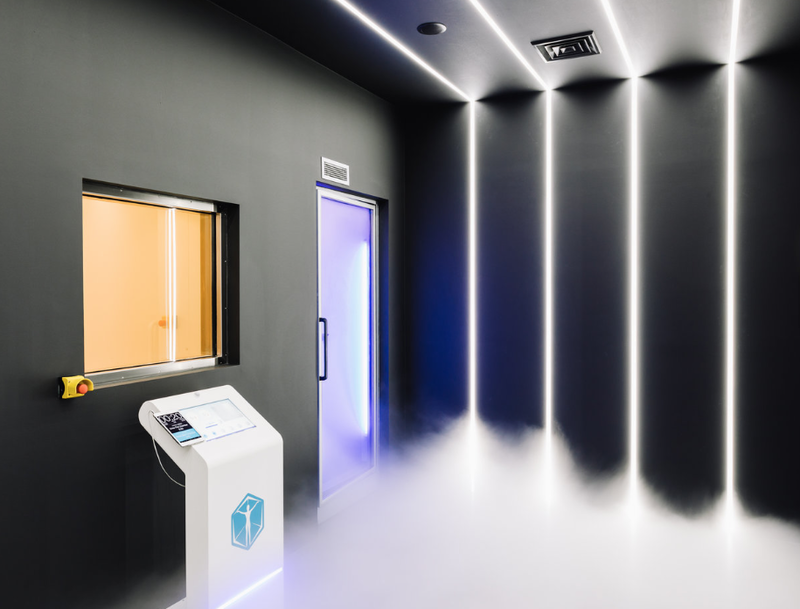 "Getting frozen to -110 degrees sounded like a good idea"
I knew I couldn't do this alone and luckily for me my Friend was recently watching the Kardashians and mentioned they where using cryotherapy so I knew I had that up my sleeve and she would be keen to come with me! INCREASES METABOLISM... LEARN MORE and more! The staff where super friendly and instructed us to put on a cryo suit, socks, mittens and earmuffs. I had to wear a beanie cause of my bald head and I am GLAD I did! We got to pick the music we played when we went inside the ice box. We decided to put on Uptown Funk so we had something up lifting to take us through our first session. After being taken through the safety precautions and what to expect. We stripped down to our undies and entered the first chamber. Which is super cold! It gets you prepped and ready for the actual therapy. after a few seconds in this room we're instructed to enter the main chamber! Immediately I noticed a change in temperature. this was cold! I have never experienced anything this cold.I could barely talk and could feel the air quickly chilling my skin. Breathing in the air was difficult as it was so chilling every time I'd take a big breath out the room would fog up slightly more. At this point I started thinking about how cold my head would be and was super thankful for my beanie! Me and P were trying to throw light conversation to each other as it was quite intense to just stand there silent. luckily we had Mark Ronson banging on! I felt like I couldn't last the session then I heard the voice that I was half way thinking about all the benefits and hoping I would feel them when I exited I kinda zoned out and entered into a meditive state and just let the cold take me over. Relaxed the last minute or so. even though I was cold. I didn't feel cold internally through out the entire session and I felt super safe as we were being watched by the operator directly outside the machine the whole time. when the machine instructed us to exit into the thawing out chamber we raced the door open and spent a few seconds warming up in this still super cold room. Bursting out I was excited to escape and instantly could feel my body rush with warm blood revitalising me from the inside out.Before entering the chamber my body skin temperature was 33 degrees it had now been chilled down to 12!! I had to stand still and take a breath and let the feeling take me over. Me and Pia took a few minutes relaying our experience and how good we felt while we did some light activity on the bike. I could notice an instant relief in some slight lower back pain I was dealing with. if you've never heard of cryotherapy before I'd recommend trying this out and if you have to do it. It's not for the faint of heart (literally) but it is an amazing experience and super thankful to the lovely staff and I cannot wait for my next session.